Size 6, 13 H VS2 diamonds in 18K gold. Normal wear. 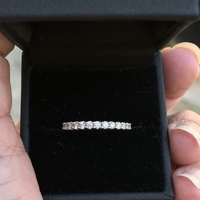 Love this ring, but have a few emergency expenses, so it must go. PayPal only, US shipping only. Please ask any questions. allison.mori at gmail. It took awhile to put this set together, and it's absolutely gorgeous. 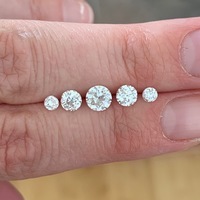 This is a perfectly matched set of five OEC diamonds. I had previously listed just the center stone, but now I'm considering selling the whole set together. The set would make an incredible 5 stone ring, or could be used for multiple matched pieces of jewelry. The three largest stones are all GIA certified and J color. Smaller outside pair are H-J color. The diamonds are graduated in size: 3.1mm, 4.5mm, 5.5mm center. I have videos upon request, just send me an email. They are super fiery with lots of rainbows and are just spectacularly beautiful. Specs: Center stone: GIA #2185954984 .63ct J SI1, measuring 5.48 x 5.39 x 3.30mm Right side stone: GIA #2195939776 .37ct J VS2, measuring 4.59 x 4.48 x 2.83mm Left side stone: GIA #5192939522 .38 J VS2, measuring 4.55 x 4.43 x 3.03mm Outer pair of stones: .267 ctw, H-J VS2, measuring 3.1mm My email is tandiwe76@gmail.com. Shipping through USPS Priority mail in the USA. I can ship out of the USA too. Payments through PP F&amp;F. Other options possible, please contact me with any questions. Sales are final. Thanks! This beautiful bezel ring is 14k yellow gold in size 3.5 and holds a 5x5mm near colourless moissanite. It's easy to wear, is extremely comfortable, and the stone itself has an attractive faceting pattern that is clearly discernible. And thanks to the simple design, it is also easily resizable. I purchased this in mid-February, and have worn it only a handful of times since. I would estimate that I have worn it around ~20 times. I adore it- but have since realised that I lean much more towards round cuts. Please feel free to contact me at rosevny@gmail.com to discuss. Price is not inclusive of shipping fees. No returns. Thank you. Intense Blue Sapphire, 1.07 ct.
A beautiful, bright, well saturated blue. ***DETAILS*** Variety: Blue sapphire Weight: 1.07 ct. Color: An intense blue of a medium tone Shape &amp; cut: Round, modified brilliant crown with a flower cut pavilion Dimensions: 5.71 – 5.80 x 4.05 mm Clarity: Eye clean Treatments: Standard heat only Lab report: A full format lab report is included with the stone stating standard heat without diffusion ***ADDITIONAL INFO*** A bright blue sapphire with lots of brilliance. The color is a very pleasant, mellow, medium-toned blue but it’s as strongly saturated as this tone category can get so the stone isn’t even slightly greyish or dull (as many medium to light blue sapphires can be). The crown is slightly high, but that has no bearing on how it looks face-up in this case (no undue extinction or windowing). It shows excellent light return, mainly thanks to the flower cut pavilion. ***COLORS AND ACCURACY*** All of our images are extensively, carefully and thoroughly edited and color-matched to reflect the stones in normal diffused daylight by editing with the stone and the monitor side by side in daylight. The colors on the photos are as close as they get to reality when viewed on a normal monitor with a generic RGB display calibration profile - this includes most mobile devices but please always check the posts on a desktop/laptop to be sure. If you'd like more photos or videos, please by all means just drop us a mail. ***SHIPPING*** Tracked and insured shipping is included in the price. ***PAYMENT*** PayPal preferred under $1,000. Over $1,000 a direct bank TT is preferable but PayPal is still an option if their fees are covered. ***RETURNS*** Returns are totally okay but please note that they come minus the insured shipping costs paid to send you the stones. A government-issued invoice signed and stamped by Customs, government valuer-gemologists and postal agents for stones + shipping comes within every parcel with the exact breakdown of shipping and insurance costs paid on export. Most of the time those amount to $55-65 for sub $1k C.I.F. values. ***CONTACT*** Contact us here or mail adamantinternational@gmail.com directly for more photos, videos, or additional info. If you have any questions, just ask. :) For more info on various currently available stones, please visit (currently under construction): www.adamantgems.com Follow us on Instagram at www.instagram.com/adamant.gems/ for occasional eye candy and recently sold stones. Unheated Purple Sapphire, 1.20 ct.
A gorgeous untreated purple sapphire. ***DETAILS*** Variety: Purple sapphire Weight: 1.20 ct. Color: A well saturated purple of a medium to medium-dark tone Shape &amp; cut: Heart, modified brilliant crown with a step cut pavilion Dimensions: 6.35 x 6.21 x 4.01 mm Clarity: Eye clean Treatments: None Lab report: A full format lab report is included with the stone stating no heat Price: $1,100 ***ADDITIONAL INFO*** A beautiful, bright and very rare purple sapphire. This particular hue would already be considered rare in heated sapphires, but it’s actually much rarer in unheated ones. It has plenty of colorful sparkle and depending on the environment, shows flashes of blue, violet, lavender and pink (especially in direct sunlight). It is not color zoned however and holds its color very well, appearing evenly and beautifully balanced in diffused daylight indoors and outdoors. It shifts to a pinkish orchid purple in incandescent light. The hue is ever so slightly greyish, exactly as visible in the daylight images (#2-#4). The color is spot on in those. ***COLORS AND ACCURACY*** All of our images are extensively, carefully and thoroughly edited and color-matched to reflect the stones in normal diffused daylight by editing with the stone and the monitor side by side in daylight. The colors on the photos are as close as they get to reality when viewed on a normal monitor with a generic RGB display calibration profile - this includes most mobile devices but please always check the posts on a desktop/laptop to be sure. If you'd like more photos or videos, please by all means just drop us a mail. ***SHIPPING*** Tracked and insured shipping is included in the price. ***PAYMENT*** PayPal preferred under $1,000. Over $1,000 a direct bank TT is preferable but PayPal is still an option if their fees are covered. ***RETURNS*** Returns are totally okay but please note that they come minus the insured shipping costs paid to send you the stones. A government-issued invoice signed and stamped by Customs, government valuer-gemologists and postal agents for stones + shipping comes within every parcel with the exact breakdown of shipping and insurance costs paid on export. Most of the time those amount to $55-65 for sub $1k C.I.F. values. ***CONTACT*** Contact us here or mail adamantinternational@gmail.com directly for more photos, videos, or additional info. If you have any questions, just ask. :) For more info on various currently available stones, please visit (currently under construction): www.adamantgems.com Follow us on Instagram at www.instagram.com/adamant.gems/ for occasional eye candy and recently sold stones. Unheated Blue Sapphire, 1.14 ct.
An amazing unheated blue sapphire. ***DETAILS*** Variety: Blue sapphire Weight: 1.14 ct. Color: Vividly saturated blue of a medium tone Shape &amp; cut: Rectangular cushion, modified brilliant crown with a step cut pavilion Dimensions: 6.41 x 5.31 x 3.82 mm Clarity: Eye clean Treatments: None Lab report: A full format lab report is included with the stone stating no heat Price: $1,450 ***ADDITIONAL INFO*** Bright, strongly saturated and untreated. The color looks gorgeous in any sort of light and shifts between a medium, more cornflower blue-like tone in the mornings and early afternoons to a medium-dark tone closer to royal blue in the late afternoons as the light dims. It stays vividly saturated and sparkly at all times. 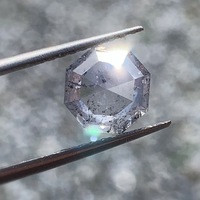 While the stone is industry-standard eye clean, a crystal along the girdle can sometimes become visible if it’s seen close up at just the right angle. At most viewing angles it remains hidden because of how the brilliance pattern behaves and because the shape and color of the crystal itself mimic extinction in this stone - so it tends to appear as a part of the overall play of color rather than a distinctly visible separate feature. ***COLORS AND ACCURACY*** All of our images are extensively, carefully and thoroughly edited and color-matched to reflect the stones in normal diffused daylight by editing with the stone and the monitor side by side in daylight. The colors on the photos are as close as they get to reality when viewed on a normal monitor with a generic RGB display calibration profile - this includes most mobile devices but please always check the posts on a desktop/laptop to be sure. If you'd like more photos or videos, please by all means just drop us a mail. ***SHIPPING*** Tracked and insured shipping is included in the price. ***PAYMENT*** PayPal preferred under $1,000. Over $1,000 a direct bank TT is preferable but PayPal is still an option if their fees are covered. ***RETURNS*** Returns are totally okay but please note that they come minus the insured shipping costs paid to send you the stones. A government-issued invoice signed and stamped by Customs, government valuer-gemologists and postal agents for stones + shipping comes within every parcel with the exact breakdown of shipping and insurance costs paid on export. Most of the time those amount to $55-65 for sub $1k C.I.F. values. ***CONTACT*** Contact us here or mail adamantinternational@gmail.com directly for more photos, videos, or additional info. If you have any questions, just ask. :) For more info on various currently available stones, please visit (currently under construction): www.adamantgems.com Follow us on Instagram at www.instagram.com/adamant.gems/ for occasional eye candy and recently sold stones. A fun &amp; interesting looking blue-white sapphire. Technically not a bi-color since colorless doesn't count, but the stone behaves like a bi-color sapphire. ***DETAILS*** Variety: Blue sapphire Weight: 2.06 ct. Color: A medium toned blue with clear colorless zones Shape &amp; cut: Rectangular cushion, modified brilliant crown with a flower cut pavilion Dimensions: 7.56 x 6.60 x 4.71 mm Clarity: Eye clean Treatments: Standard heat only Lab report: A full format lab report is included with the stone stating standard heat without diffusion Price: $1,450 ***ADDITIONAL INFO*** Most color-zoned blue sapphires either look off-blue, have a greenish undertone, show greyish overtones, or are flat-out too dark. It’s not by any means common to find an actually pleasant and well saturated, overtone-free blue hue with clearly distinct zones of no color. This is partially also because it’s discouraged by the trade – cutting will always as a rule strive to give a stone the clearest and most even blue hue possible and any zoning will be minimized as a result of that effort. This stone actually shows a very nice bright blue hue and the colorless zones are clearly distinct from the blue ones so the overall effect looks quirky but very pleasant to the eye. ***COLORS AND ACCURACY*** All of our images are extensively, carefully and thoroughly edited and color-matched to reflect the stones in normal diffused daylight by editing with the stone and the monitor side by side in daylight. The colors on the photos are as close as they get to reality when viewed on a normal monitor with a generic RGB display calibration profile - this includes most mobile devices but please always check the posts on a desktop/laptop to be sure. If you'd like more photos or videos, please by all means just drop us a mail. ***SHIPPING*** Tracked and insured shipping is included in the price. ***PAYMENT*** PayPal preferred under $1,000. Over $1,000 a direct bank TT is preferable but PayPal is still an option if their fees are covered. ***RETURNS*** Returns are totally okay but please note that they come minus the insured shipping costs paid to send you the stones. A government-issued invoice signed and stamped by Customs, government valuer-gemologists and postal agents for stones + shipping comes within every parcel with the exact breakdown of shipping and insurance costs paid on export. Most of the time those amount to $55-65 for sub $1k C.I.F. values. ***CONTACT*** Contact us here or mail adamantinternational@gmail.com directly for more photos, videos, or additional info. If you have any questions, just ask. :) For more info on various currently available stones, please visit (currently under construction): www.adamantgems.com Follow us on Instagram at www.instagram.com/adamant.gems/ for occasional eye candy and recently sold stones. Light Peachy-Yellow Sapphire, 1.23 ct.
A soft yellow stone with orange flashes in the corners. ***DETAILS*** Variety: Yellow sapphire Weight: 1.23 ct. Color: Medium to medium-light toned yellow with a pinkish orange admixture in the corners Shape &amp; cut: Rectangular, standard radiant cut Dimensions: 6.69 x 5.29 x 3.66 mm Clarity: Eye clean Treatments: None Lab report: A full format lab report is included with the stone stating no heat Price: $650 ***ADDITIONAL INFO*** Looks mellow and beautiful. It was recut into a standard radiant cut from a badly cut roval of 2.60 carats and now lights up really well. It gains a bit more saturation in incandescent light, becoming slightly more orangish than in daylight. ***COLORS AND ACCURACY*** All of our images are extensively, carefully and thoroughly edited and color-matched to reflect the stones in normal diffused daylight by editing with the stone and the monitor side by side in daylight. The colors on the photos are as close as they get to reality when viewed on a normal monitor with a generic RGB display calibration profile - this includes most mobile devices but please always check the posts on a desktop/laptop to be sure. If you'd like more photos or videos, please by all means just drop us a mail. ***SHIPPING*** Tracked and insured shipping is included in the price. ***PAYMENT*** PayPal preferred under $1,000. Over $1,000 a direct bank TT is preferable but PayPal is still an option if their fees are covered. ***RETURNS*** Returns are totally okay but please note that they come minus the insured shipping costs paid to send you the stones. A government-issued invoice signed and stamped by Customs, government valuer-gemologists and postal agents for stones + shipping comes within every parcel with the exact breakdown of shipping and insurance costs paid on export. Most of the time those amount to $55-65 for sub $1k C.I.F. values. ***CONTACT*** Contact us here or mail adamantinternational@gmail.com directly for more photos, videos, or additional info. If you have any questions, just ask. :) For more info on various currently available stones, please visit (currently under construction): www.adamantgems.com Follow us on Instagram at www.instagram.com/adamant.gems/ for occasional eye candy and recently sold stones. **Please contact me at autumn.froias@gmail.com with interest and offers. Loupe Troop's messaging system can be a little spotty. ** For sale: A gorgeous vintage-style amethyst and white topaz ring. It features an approximately 2 carat amethyst cabochon surrounded by 26 very sparkly white topaz. The ring also features a lovely seed pearl on top. It is a size 7.5 but is sizable. The ring measures 19 mm across and the band is 2 mm. It is hallmarked 925 for sterling silver. It was sold to me as 10% platinum and 90% sterling silver, but it is only marked for sterling silver. The ring weighs 3.1 grams. In excellent condition and was worn less than a handful of times. Asking price includes insured shipping within the US, but I am open to offers. Feel free to ask any questions you may have, as this will be a final sale. Thank you for looking! Yes you read it correctly! Act fast as I’m only offering this discount for a limited time! Take 25% off ALL already reduced listings! PLUS if more than one piece is purchased, take 30% OFF TOTAL! See my listings here —&gt; https://loupetroop.com/users/kendaklocks Payment by PayPal Friends/Family please and I will provide FREE PRIORITY USPS Shipping in USA. Thanks for looking! As I am a private seller, please ask ANY and ALL questions as this is a Final Sale. Contact me at kendaklocks@sbcglobal.net. Price drop! Kasumi pearl, tourmaline, and 18kt yg earrings by Kojima Pearls! Price drop from $150 to $99!! Up now is a stunning pair of earrings I bought from Kojima Pearls over 10 years ago. Raw, organic tourmaline pieces in shades of pale lavender, mauve, and pink lead down to Kasumi pearls with gorgeous lustrous colors and lovely ripply surfaces. The earwires and findings were acid tested as 18kt gold. Total length of earrings is just shy of 2 1/2". The pearls are both about 10x10mm. US shipping is $10 priority. Please contact me at beckycameron@msn.com, PayPal (f&amp;f) is the same. Please ask for more pictures and all questions before purchase as I do not take returns, as a private seller. Thank you! !